The Rebel Beaver Wax was formulated to give a rich and bold shine to your paint. It is effortless to apply, taking only a few minutes to dry after application. Wipe away excess and dry residue with a microfiber. It will provide a lasting shine on everything from bumpers, paint, and even your custom forged wheels. 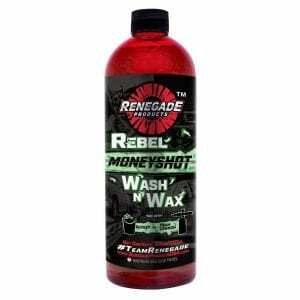 Rebel Moneyshot Wash N’ Wax is formulated for a dense neutral pH foam that clings to the applied surface. Utilizing cutting-edge surfactants, the suds penetrate to remove contaminants. Formulated with emulsified Brazilian Carnuaba wax, the surface is left with a waxed protective coating. Our water-less wash is engineered for safe, on-the-go cleaning and protection for yous vehicle’s surface. This product is formulated with surfactants, carnauba wax, and lubricating agents to safely remove dirt and contaminants from your paintwork without leaving scratch marks or blemishes. 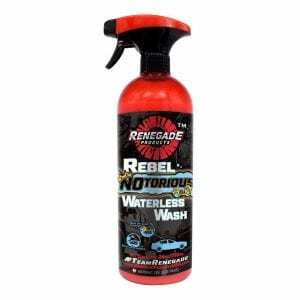 Whether you are prepping your vehicle for a show or just need a quick, on -the-go wash, this is the product for you. And if you don’t know, now you know. Rebel Pro Red metal polish has been developed with professional feedback to allow for a more aggressive cut than Rebel Red. 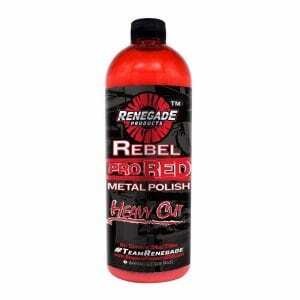 Typically, our customers who perform a high-speed polish would finish with a Rebel Red, whereas customers who do not high-speed polish would be best suited with Rebel Pro Red. Rebel Pro Red can be used on aluminum & stainless. We recommend using this with a new microfiber towel or applicator pad. 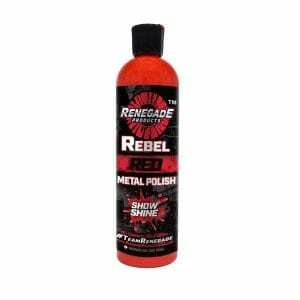 Rebel Red Metal Polish is a liquid metal polish used by polishers for a radiant mirror finish. Formulated to tackle two main requirements by professional polishers: to provide a mirror finish while polishing, and to leave a durable seal to keep the finish lasting as long as possible. 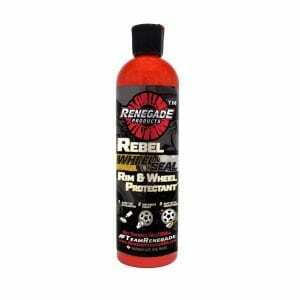 Rebel Rubber and Vinyl is formulated as a rubber conditioner and interior vinyl cleaner. Used on rubber, leather, and vinyl it leaves the surface pliable, conditioned, and oil free. Use Rebel Rubber and Vinyl to leave a clean dark surface on the outside of your tires that doesn’t leave a sticky or tacky surface. Also use inside on your dash to help hydrate and protect your interior surfaces. Rebel Savage A.P.C. is a robust all-purpose cleaner that is engineered to clean and disinfect the interior and exterior of your vehicle. This product is best for spot cleaning the interior of your vehicle like the dash board, seats & crevasses that store and attract dirt. Savage A.P.C. is also very effective at cleaning the undercarriage of your vehicle that can harbor grime & road tar. 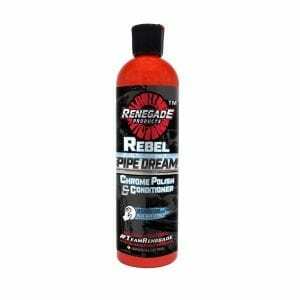 This is a great all around cleaning product used prior to our Rubber & Vinyl. Rebel Spot Assassin is a safe, non-toxic and non-abrasive water spot remover that targets and eliminates tough water spots on any surface in seconds. It is designed to remove alkaline water mineral stains that can sit on your paint, glass, wheels and polished aluminum or stainless parts. Rebel Spray Wax is typically referred to as an instant detailer and is used to make the paint on your big rig, pickup truck, or car POP. Our spray wax is water based and does not leave a film or residue on the surface. Spray directly onto towel prior to application. 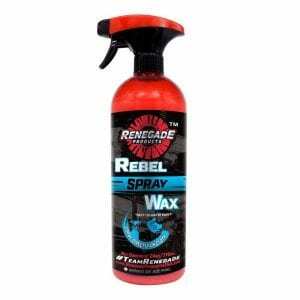 PRO TIP: Prior to using our Rebel Spray Wax, it is critical that your car or truck’s paint surface is clean and free of debris. Rebel Wheel Seal is a proprietary blend of sealants designed to create a barrier to protect wheels and rims from brake-dust, road grime, and water spots. 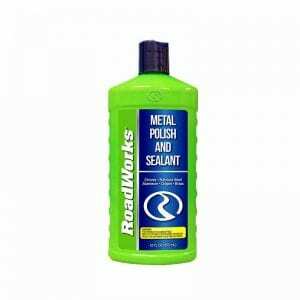 With an anti-static formulation, Wheel Seal guards against the adhesion of contaminants to repel brake dust, road debris, and salt. Safe on powder coated, painted, and polished aluminum forged wheels.